HILLSBORO, OR--(Marketwired - Mar 17, 2014) - Phoseon Technology introduces the FireJet™ FJ100 air-cooled products for UV LED curing. 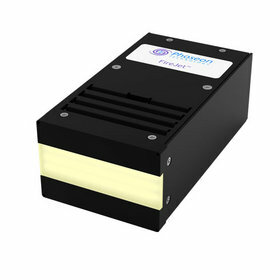 These new UV light sources provide high irradiance in a small form factor making them easy to integrate into space limited environments. FireJet FJ100 products are available in multiple wavelengths (365, 385, 395, and 405nm), multiple curing lengths (75mm, 150mm, and 225mm) all with 20mm wide curing window and are ideally suited for electronics manufacturing and assembly, wood coatings, and wide format printing applications where small form factor but high peak irradiance is vitally important. "By simply placing the lamps end-to-end, the FJ100 products scale to length providing greater flexibility and service options," stated Joe Becker, Product Marketing Manager. "These quiet, air-cooled products easily integrate into low-noise environments where water cooling is prohibitive." While bringing the three-tiered benefits of UV LED curing (advanced capabilities, operating economics, and environmental advantages), Phoseon's products add additional capability with superior performance, integrated control, and outstanding reliability for customers' tough curing environments.